Q: What features do I get if I Go Pro? 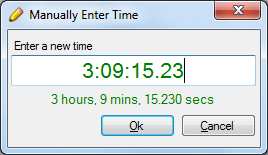 You can manually enter the time to display on a timer in either dd:hh:mm:ss.sss format or in fractions of an hour. You can set up a timer or countdown to reset automatically every time the application starts. Countdowns can be configured to automatically restart or reset when they hit 0. Recent task switches appear when you hover over the focus light. WCF Service layer that provides other applications with the ability to automate and pull data from WatchMe. Click here for more information. Q: Sounds good, so how do I “Go Pro”? A: All you have to do is make a donation right here. Q: I made my donation. Where’s my key? A: At the current time I am handling key requests manually so it may take a day or so for me to get the key back to you via email. If you donated and haven’t gotten your key, send an email to support (at) flamebrain (dot) com.